My dad made the best biscuits and I have never been able to duplicate his so I am always on the hunt for a great biscuit recipe. Isn’t it funny how recipes with lots of ingredients can turn out great but simple dishes like potato salad, pimiento cheese and biscuits are hard to get right? Or maybe it is just me! Anyway, I came across this recipe on the Southern Living website and really love it. It makes big flaky biscuits. Boone loves them with Apple Maple jam or with any of my homemade jams. They are just as good with only butter or with sausage or ham on them. The only thing I did different from the recipe is I never have self-rising flour so I usually make a batch up when I plan on having these biscuits. 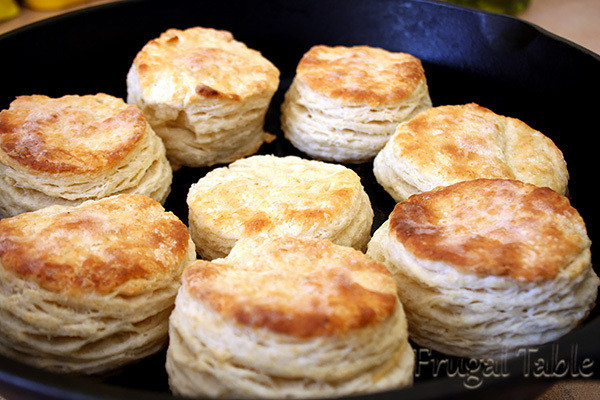 The biscuit recipe has several ways to bake them and my favorite is to warm a cast iron skillet in the oven, then rub a bit of butter in it and put the biscuits in. That gives them a crunchy bottom that is so good. I tend to roll them a bit thicker and normally get around ten biscuits. My skillet only holds eight so I cook the last two later. Here are the links to both recipes.